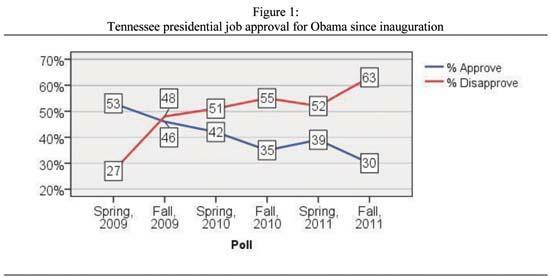 For the first time since President Obama’s inauguration in 2009, more than twice as many Tennesseans disapprove of the job he is doing as president than approve, according to the latest MTSU Poll. Fully 63 percent now say that they disapprove of the job that the president is doing, while only 30 percent say they approve, with the rest saying they don’t know whether they approve or disapprove, or refusing to answer the question. As shown in Figure 1, these responses indicate a marked increase in disapproval and decline in approval since the spring 2011 poll (the differences are outside of both polls’ margins of error), and all-time high disapproval and low approval numbers in the state for the job Obama is doing as president. For comparison, Pollster.com’s aggregate of polls estimates job approval for President Obama nationally at 42 percent and disapproval at 53 percent as of October 14, 2011. Results were similar among Tennessee’s likely voters, with 66 percent saying that they disapprove of the job Obama is doing as president, and only 30 percent saying that they approve. Tennessee’s self-identified Democrats, 67 percent of whom approve while 25 percent disapprove, do not appear to have abandoned Obama, despite some decisions by the administration that have been characterized in the media as unpopular with the party’s liberal base. Nor do the administration’s policies or initiatives appear to have endeared Obama to Tennessee’s self-identified Republicans, a whopping 89 percent of whom disapprove of the job Obama is doing while a tiny 6 percent of whom approve. Independents also disapprove of the job the president is doing by a broad margin, 66 percent compared to only 26 percent who approve.